The Global Settings are like a foundation for the design. This is where you would set up any core defaults for the theme’s behavior. Then, you have the Local Page Settings where you can override the global settings (on that page). Think of the local page settings like the cosmetic layer on top that you can toggle on or off or you can simply have those features pull from the global settings defaults. Please watch the video below to familiarize yourself with how it works. The global settings admin panel is represented by the tabbed areas below i.e. 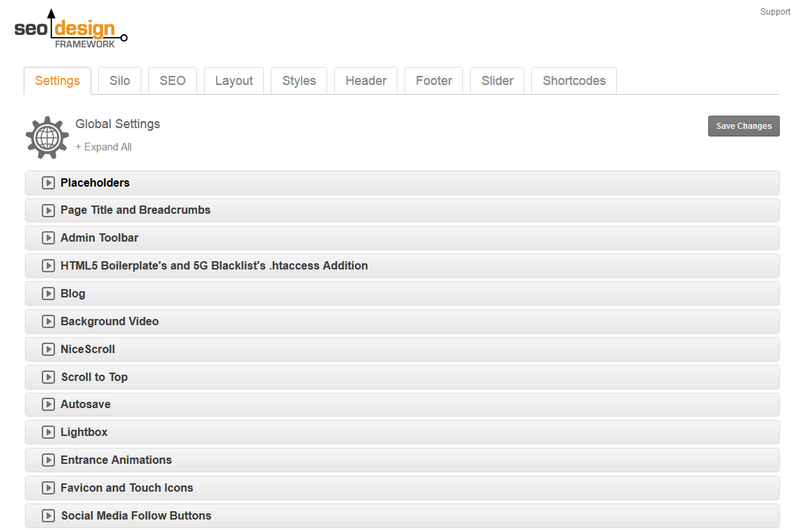 [ Settings | Silo | SEO | Layout | Styles | Header | Footer | Slider and Shortcodes ]. Nested beneath each tab are chevrons which when clicked reveal additional settings to customize theme options. Using the SDF Help menu on the left as navigation, we'll highlight key features in each of the respective tabs and provide you with insight covering two critical metrics which are 1) what it is and 2) what it does. Like SEO Ultimate, the framework was built using a modular approach. This means that you can simply enable or disable the features to determine if their code is active or inactive. So, if you have another script, plugin or solution in place, you can simply disable the feature in question to prevent unnecessary redundancy or collisions. 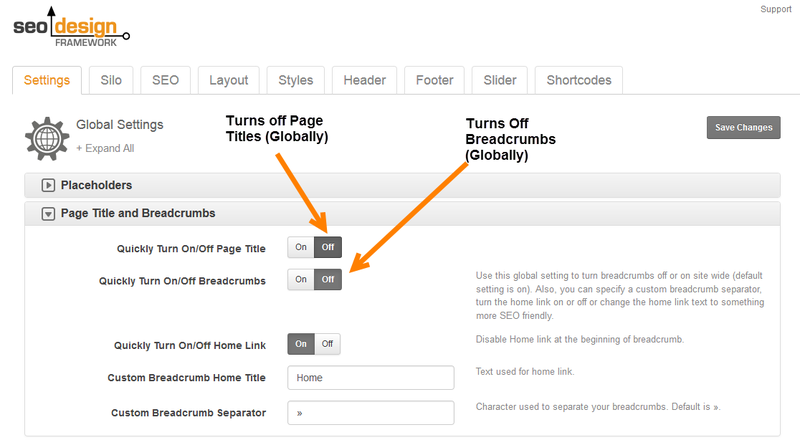 For example, if you turned the breadcrumbs Off in the Global Settings then they would be off when you created a new page or post in the Local Page Level Settings by default. 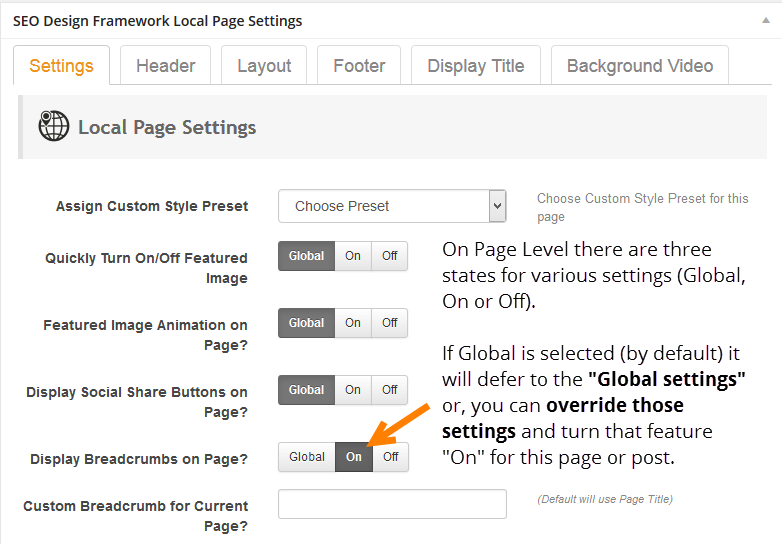 The Local Page Settings (located under the WordPress editor on pages or posts) allow you to optionally toggle the Global Settings on or off (on a page-by-page basis). So, using the example from above (with the breadcrumbs that I just disabled on the Global Settings), I could activate on this page. This Global / Local functionality includes any of the options displayed in the Local Page Settings Tabs (e.g. Settings, Header, Layout, Footer, Display Title, Background Video) and each sub menu options under those tabs. This means that you can truly customize each page by either turning off assets globally and then selecting what you want active at the page level or vice versa (turning things on in the Global Settings and then Off in the Local Page Settings).